John E. Altmeyer was born on October 20, 1947 in Oak Park, Illinois to Anthony and Rose (nee Vazzano) Altmeyer. 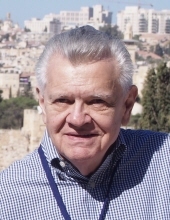 He died Monday, October 15, 2018 at home in Buffalo Grove. John was an active member of St. Edna Catholic Church and served on the board of Catholic Charities - Northwest Region. John is survived by his daughters, Alison (Peter Harley) Altmeyer, Jacqueline (Mark) Venditti, and Karen (Ronald) Pantzis; grandchildren, Ashley Pantzis, Derek Pantzis, Tyler Venditti, Hunter Venditti, Brianna Venditti, and Sawyer Venditti; sister, Rosalie (Thomas) Spanos; many nieces and nephews. He was preceded in death by his brother, Anthony (the late Jean) Altmeyer; sister, Gloria Russell and his parents. Visitation from 9:00 am until time of Mass, 10:00 am, Monday, October 22, 2018 at St. Edna Catholic Church, 2525 N. Arlington Heights Rd., Arlington Heights, Illinois. Entombment at St. Michael the Archangel Cemetery. In lieu of flowers memorials may be given to Catholic Charities, 721 N. LaSalle, Chicago, IL, 60654. Funeral information and condolences can be given at www.GlueckertFuneralHome.com or (847) 253-0168. "Email Address" would like to share the life celebration of John E. Altmeyer. Click on the "link" to go to share a favorite memory or leave a condolence message for the family.